They have created a whole new Numeracy section and are growing it step by step. Starting with basic number recognition and it is going to end up going all the way through to Maths for Year 6. It is the Maths Stage by Stage. If you are new to home education, have younger kids and are wondering what you need to do and possibly in what order you would like to introduce Maths this Maths Stage by Stage gives lots of great ideas. They start from basic numeracy ideas like one to one correspondence and progress step by step up to Addition and Subtraction to 20 (for now – like I said that are always adding to this). They also include lots of resources using 10 frames or base 10 which I used a lot with my kids. So some of the Key areas which you might want to look at – Ordinal Numbers, Number bonds, Fact families, Numbers up to Twenty. With each section they include a brief explanation and suggestions on how to introduce the topic and lots of different worksheets. I think this Maths Stage by Stage is an absolute gem for new home educators who are nervous about Maths. And not included in their Maths Stage by Stage section but a Maths section we have been using a lot lately – their Times Table resources. (They have posters, worksheets and multiplication games). vocabulary cards (which we love using for spelling) and High Frequency word printouts (we used some of their bookmarks with our stories when the kids were still learning to recognise basic words – High Frequency Bookmark Post). One of my favourite and most used English sections are their Story pages (Love that they have normal lined and handwriting versions – handwriting versions have a middle dotted line to help kids with the height of their small letters). And don’t forget about the Word Searches and Crosswords and Word Sudoku. One of the sections that we have not used a lot but which looks so useful is their Geography section – Lots and Lots of Maps and a really handy My Country Study 4 page document which would be great for kids to use to summarize all the facts that had learnt about a country. And Science themes – they have some Human Body posters (Including ones where the kids need to fill in the labels themselves, lots of fun animal pages and some seasonal pages. (our version of a seasonal tree). It really is worth spending some time looking at their Teacher section to see what they have on the site. But don’t forget all those puzzles and the massive range of pages to inspire Art – we LOVE using their templates for art activities. As I mentioned in the beginning this is NOT a sponsored post in any shape or form. 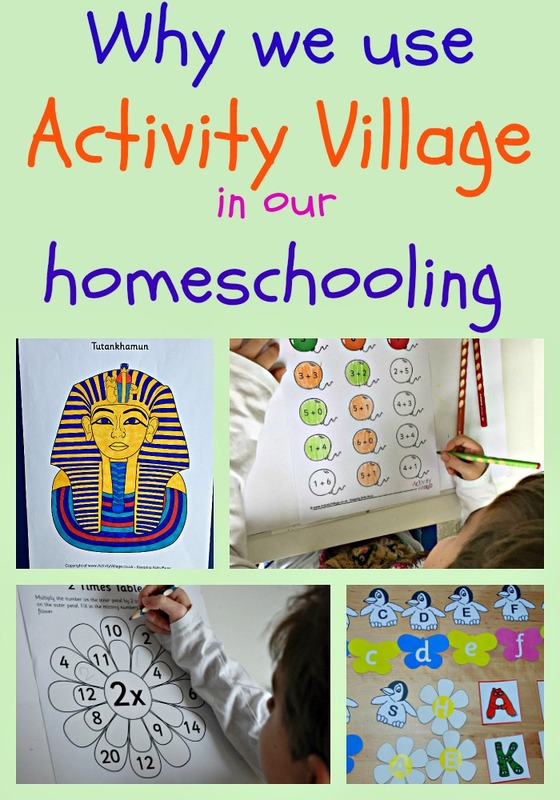 We started using Activity Village when we started home education but over the last 18 months I have been using their site more and more. They really have been working hard at increasing the number of printouts on their site and I think they have done an amazing job. There are only two of them so I am constantly amazed at how much they add each week. And I have only ever found 1 error on a page (if you ever do find an error or a link is not working just email them they are super helpful and will fix it). This entry was posted in Homeschooling and tagged activity village, educational resources, home ed, home education, homeschooling, Maths resources. Bookmark the permalink. Just love how you incorporate craft work into your subject learning….well done….and the children are happy to co-operate.